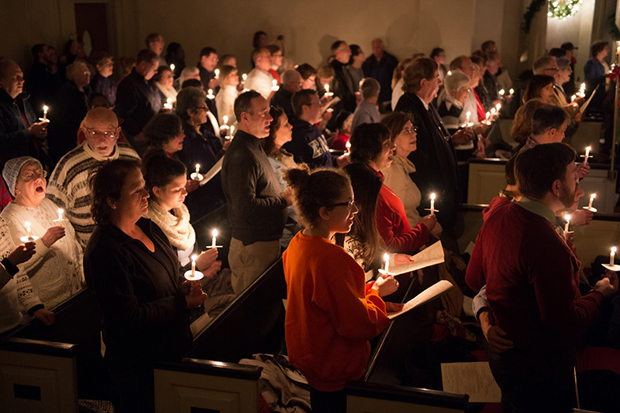 Audience members sing carols during a previous “Holidays at Hendricks” concert. Syracuse University’s annual holiday concert, “Holidays at Hendricks,” takes place this year on Sunday, Dec. 4. The performance by a wide range of talented musicians and vocal artists is free and open to the public. The show begins at 7:30 p.m. This year’s show is presented by the Hendricks Chapel Choir, in collaboration with the Syracuse University Brass Ensemble, which is directed by James T. Spencer. The event will also feature performances by the University Singers (John Warren, director), the Syracuse University Women’s Choir (Elisa Dekaney, director), the Windjammer Vocal Jazz Ensemble (Jeff Welcher, director) and the Syracuse University Concert Choir. The concert will begin with University Organist Annie Laver performing Bach’s famous organ prelude “In dulci jubilo” (BWV 729), followed by a new arrangement of the piece for all of the combined musicians and vocalists. Spencer has created a special arrangement of the finale from Ralph Vaughan Williams’ “Dona Nobis Pacem” to end the performance prior to the traditional candle lighting and singing of “Silent Night.” The concert will feature pieces by Daniel Pinkham, Moses Hogan, Ola Gjeilo, Dan Forrest, Craig Phillips, Philip Ledger and many others. Admission is free and open to the public. Doors will open at 6:30 p.m. and space is limited. Donations of non-perishable food items for the Hendricks Chapel Food Pantry will be accepted. Parking is available in Q1, Irving Garage and Stadium Lots. A free shuttle from Irving and Stadium will be provided.